Detroit, in the popular imagination, is a city in need of saviors, or at least supervision. (It is impossible to ignore the racist overtones in that perception of this majority African-American city.) To many outside observers, Detroit is best known for its poverty and crime, its exodus of jobs and people, its mournful ruins. Less well known are Detroit’s home-grown efforts to make positive neighborhood change despite disinvestment and sometimes tone-deaf state oversight. In 2010, Detroit launched a 24-month visioning process intended to engage a high percentage of Detroit’s 700,000 residents in the crafting of a 50-year framework for Detroit’s future. Instead of focusing on bad things to be removed, this process focused on building on Detroit’s many assets. The visioning process produced a 50-year framework — Detroit Future City — driven by a cohort of resident leaders known collectively as Impact Detroit. After the framework was finalized, this group launched a series of pilot projects across the city to actively engage residents in the physical manifestation of that future. The first such project — the Skinner Playfield Project and its corresponding Safe Routes to School Initiative in the Denby neighborhood — is a story of incredible collaboration, of grassroots youth leadership, and of hope. To better engage young people directly with the design of their city’s future, Sandra Turner-Handy, an Impact Detroit leader and community organizer from the Denby neighborhood, worked with Jonathan Hui, a local high school teacher, to integrate the Detroit Future City framework across all four years of the curriculum. Sandra and Jonathan collaborated with the Detroit Community Design Collaborative (DCDC), which was central to the DFC planning process and continues to provide supportive infrastructure for Impact Detroit. The Denby neighborhood was not yet receiving substantial municipal assistance, so Sandra easily convinced other Impact leaders to focus their first pilot project there. Further, the DFC cited schools as potential community hubs that would serve all neighborhoods and all residents during off-school hours, so this project would model that important concept as well. Most importantly, the Denby neighborhood needed to see change, and that change needed to be locally grown. Working with Impact, Denby High School developed a new senior year curriculum, engaging students with urban planning and city improvement in each of their classes. As a capstone experience, students draw from their research to take part in an applied, change-oriented project in Detroit. After successfully getting an abandoned apartment building torn down and helping to weave smaller resident organizations into a Denby Neighborhood Alliance (DNA), the students began more boldly asserting their creative ideas. Denby’s mostly residential streets are lined with beautiful bungalow-style homes, but vacancy now also marks those homes. Northeast Detroit leads the City in foreclosures — with over 12,000 households losing their homes since 2008 through mortgage or tax foreclosures in the 48205 zipcode, which encapsulates most of Denby. Imagine being one of Denby’s more than 6,200 children, trying to walk to school in one of the most crime-ridden neighborhoods in the country. The foreclosure rate within a quarter-mile of Denby High School is 16.66%,[ii] meaning every sixth house is likely covered in vines, boarded up, marked in spray-paint with a large X to note its abandonment, and potentially housing nefarious activities. It is no surprise, then, that when Denby youth were asked what they cared most about in the community, the most popular subject of interest was crime and the second was land use. The Denby public schools are the neighborhood’s major anchor institutions; many are stunningly beautiful historic landmarks. But, the Denby neighborhood does not have enough high quality recreational spaces, and Skinner Playfield, a municipal park adjacent to Denby High School, was woefully underutilized. Skinner Playfield stopped receiving attention from the City long ago, so the students worked with local Impact leadership and DCDC to adopt and transform it. 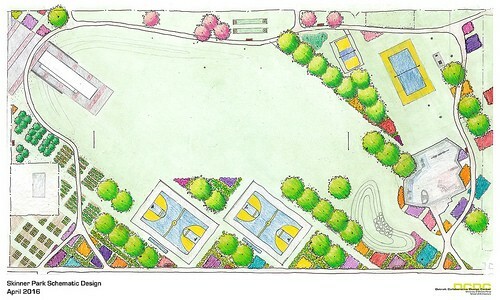 The Playfield (figure 1) now boasts two basketball courts (centrally located and adjacent to the school building because students thought potential street violence would be a distraction), a central open space, a playground for younger children, volleyball courts, pickleball courts and horseshoe pits (suggested by older neighborhood residents), raised bed gardens, compost bins, rain gardens, and a solar-powered pavilion, which provides a space for community meals and performances. The students also partnered with the DNA to map and implement dozens of safe walking routes to all the neighborhood schools. Through an organized volunteer “blitz” clean-up week in the summer of 2016, students and residents worked with thousands of volunteers from across the region to board up 362 vacant houses; remove blight on 303 blocks; conduct major repairs to 80 student homes; paint murals on multiple community buildings; and install wayfinding artwork and 125 planter boxes to mark the newly transformed “Safe Routes” to Denby schools (figure 2). Causation is tricky to attribute, but it is clear that these efforts coincided with substantial neighborhood improvements. Crime rates dropped precipitously, and after the planning curriculum was introduced, graduation rates at Denby High rose from 44 percent to 70 percent. The importance of a robust network of actors that includes, but does not center around, the City government seems to directly increase a vulnerable community’s adaptive capacity. As illustrated in the project network map (Figure 3), the blend of residents (young and old) and representatives from other social service organizations is what makes this project so strong. 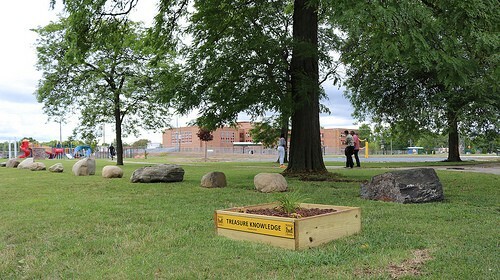 With this community-oriented solution to crime, when the gangs show some tagging and other activity in the otherwise neutral park space, Black Family Development — another important member of Impact — is on hand to work with them to maintain peaceful relations that do not disrupt the community at large. This article was originally published October 12, 2018 in CoLab Radio. [i] Sandra Turner-Handy, personal correspondence, August 16, 2016. [iii] Sandra Turner-Handy, personal correspondence, August 17, 2016. [v] James Ribbron, personal correspondence, August 17, 2016. [vi] Hakeem Weatherspoon, personal correspondence, August 17, 2016.